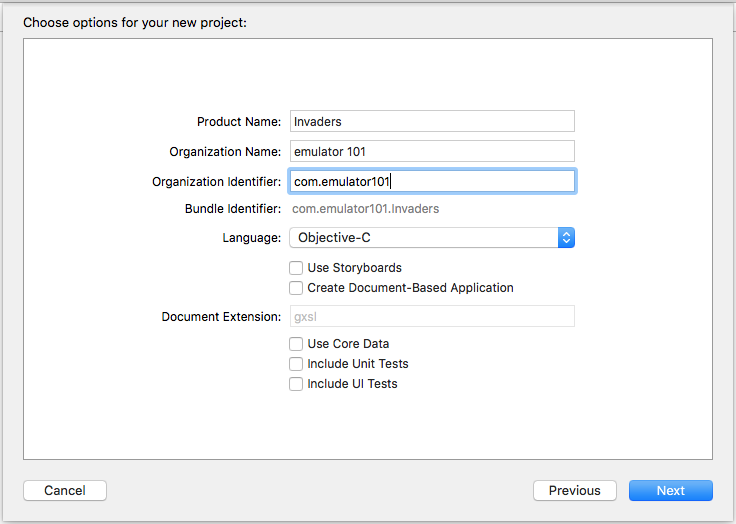 I'll go through the steps to build the emulator as a Cocoa Application. These steps are correct as of OS X 10.10 El Capitan and XCode 7.2. I'm not doing anything exotic, and I think most of these instructions will work fine back to OS X 10.5 or even before with common sense modifications. I'm going to build the Cocoa application with 3 pieces. Emulator - I'll use the 8080.c file that we've developed up to now as the emulator. Platform - We'll put the platform code in an NSView which can draw to the window and get key events. Machine code - An NSObject that implements the machine and hooks the platform to the CPU. Open XCode choose OS X -> Application -> Cocoa Application, then click "Next"
Fill in information, making sure to uncheck "Create Document-Based Application"
Make a NSView to draw the game screen and receive the Cocoa input events. In the OS X section, select Source, then choose Cocoa Class. Click Next. Name the class - I called mine "InvadersView". Make it a subclass of NSView. Save the file. In the project window, click on the "MainMenu.xib" file. 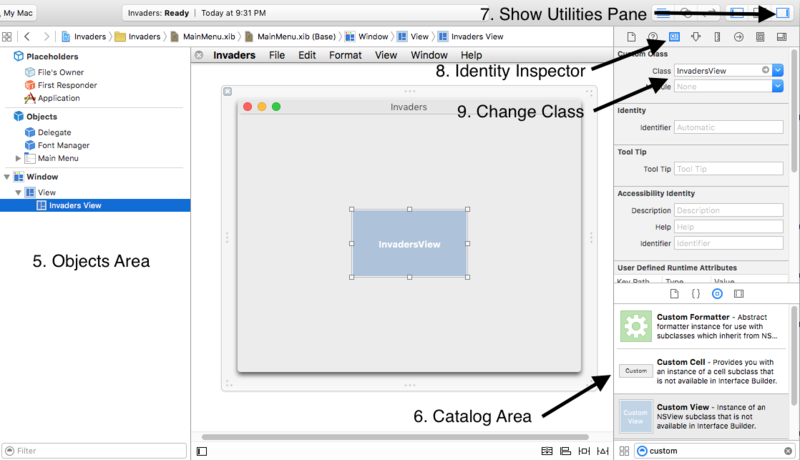 In the Catalog View, find a Custom View and drag it into the Window. In the windows area, drag the view around until the blue alignment lines show you that the view is centered. Steps 13 and 14 are in the movie below. 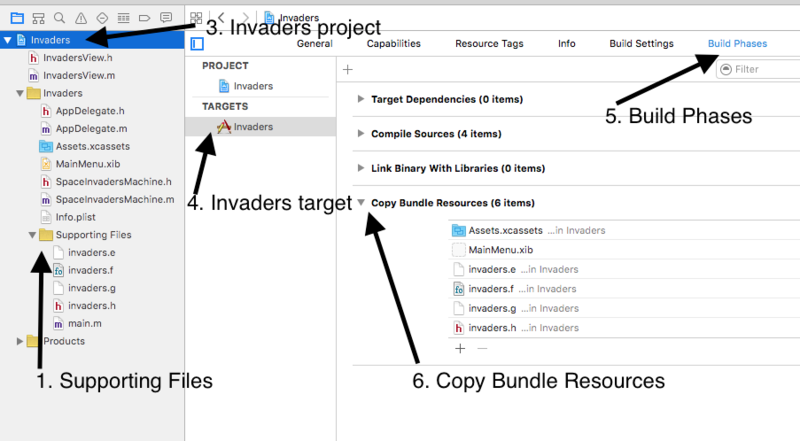 Click on the Invaders view, then click on Pin popup menu. Check the checkboxes for width and height which should already be set to 224, 256 from step 11. 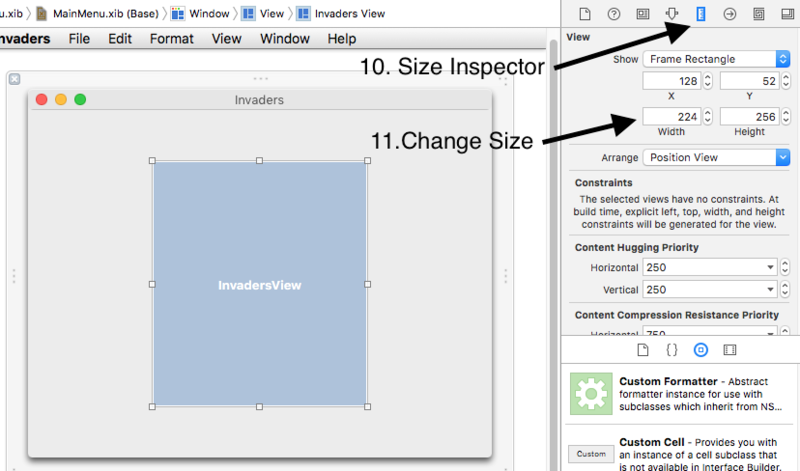 Finally, with the Invaders view still selected, control click from the Invaders view to the window's view and choose Center in each direction. Name the class - I called mine "SpaceInvadersMachine". Make it a subclass of NSObject. Click Next, then save the files. They should get automatically added to the project. I put the ROM files into the project so they get copied to the Application's bundle when it gets built. Machine gets CPU, timer, and framebuffer sharing functions. Platform code will display the machine's framebuffer image on a timer. Add keyboard handling to machine and platform.